The Great Britain Cycling Team qualified sixth fastest in the opening round of the women’s team pursuit at the Tissot UCI Track Cycling World Cup in Colombia. The British quartet of Manon Lloyd, Emily Nelson, Emily Kay and Neah Evans were last to take to the track in Cali and rode together for the first time as a foursome in competition. Their time of 4:35.651 was just over six and a half seconds behind the fastest qualifying time, set by the team from Italy. 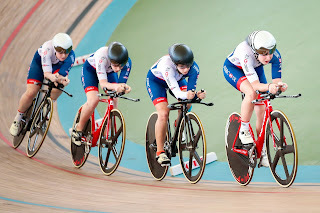 The young Great Britain Cycling Team riders will return for the first round on Sunday, racing alongside Poland, knowing a strong time would put them in contention for the bronze medal final later that day. Scottish Cycling Performance Programme rider Neah Evans, making her world cup debut for the Great Britain Cycling Team, performed double duty on the second day of competition in South America. Evans took to the track for the scratch race in a strong field, including Australia’s Amy Cure, USA’s Sarah Hammer, and Italy’s Rachele Barbieri, bronze medallist in the omnium in Cali on Friday. It was the formidable Hammer who took the spoils, leading a three rider group to take a lap on their opponents, with Russia’s Evgeniya Romanyuta getting silver and Ireland’s Lydia Gurley winning bronze. Evans finished in a creditable 11th place and will take the experience of competing on the world stage in the scratch race, into Sunday’s points race.